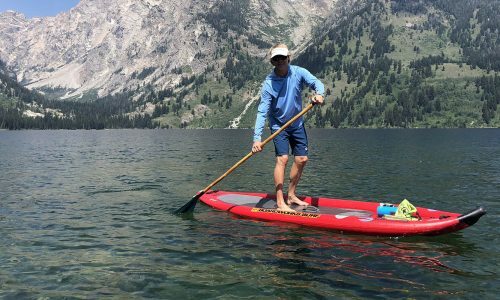 NSP expands off the Flatwater 12’6” (previously reviewed) to create the new NSP 14' Flatwater Coco Mat craft. 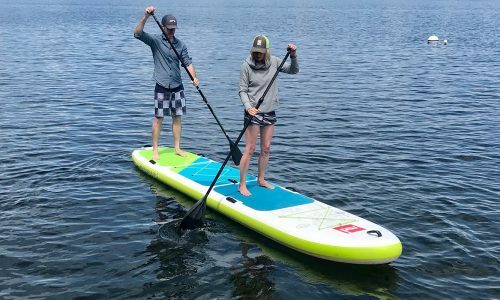 While gaining only 18 inches from the previous Flatwater board, the 14-foot Coco Mat version handles in a vastly different way and will appeal to a different customer. NSP markets this boards a recreational racer and I see nothing in my test to disprove that claim–this board is fast. Using a slightly modified cutting bow nose and stretched out profile, the Coco Mat seems to add drive to every stoke, pushing the board faster than you think possible. NSP claims the Coconut husk fibers sandwiched in with the boards fiberglass and epoxy core make it the lightest and strongest SUP’s on the market. I can’t validate those claims, but the board material translates into a light-weight and fast board in flat to light chop conditions. 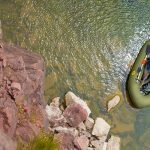 When NSP launched both the new Flatwater shape and new Coco Mat material, it was clear they were thinking differently than others in the touring SUP category. While I appreciate a more earth friendly material, I was more excited to see it used to produce a board that has a distinct look with performance and weight advantages over other boards. With the NSP 14′ Flatwater Coco Mat, NSP designers have achieved both. As with the 12’6” Flatwater board, the cutting bow makes steep waves a challenge and the added length makes the 14’0 harder to handle in the surf. 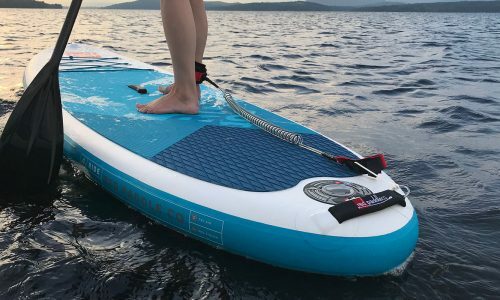 The shape of the 14′ Flatwater Coco Mat combined with a light-weight but strong deck made for speed on the water. The downside of this shape is a board that acts out in choppy, upwind conditions. The front of the 14’ board does a good job of breaking waves, but with less stability than the Flatwater 12’6”. I learned to handle the board in chop by my third trek, and advanced paddlers should be able to master this board and it’s drive quickly. Having said that, intermediate or heavier paddlers may struggle to harness the speed this board can produce. While the Coco Mat could handle small, flat waves with practice, time in the waves would be best spent on another board. 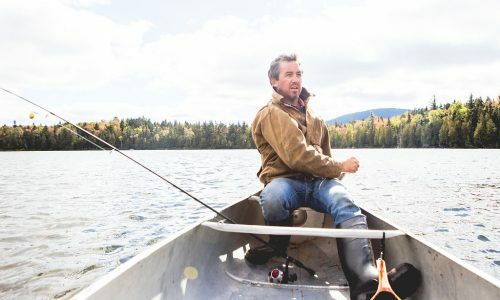 The Epoxy E2 construction combined with the Coco Mat material are both durable and light-weight–the board acted like a much shorter craft and I need to take extra time to prevent from hitting objects out of the water. This was primarily based on my experience with heavier, shorter boards and I considered it a plus. The Coco Mat is a board that will delight the fitness and touring paddler looking for speed and distance as the first priority in a board. Those looking for an easy board to cruise on may find the narrow shape harder to control than they like. 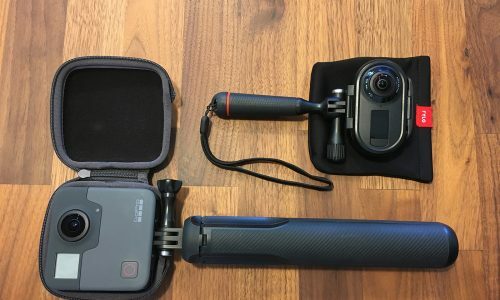 I would place this board in the category as a great fitness and race board, and an advance-level touring board for those looking for speed and distance on the water. The Coco Mat can create great times on the water, those times coming faster than with most touring boards on the market.